Fight for Pink? Looks snow white to me... Il Giro d'Incompetence. "...and all the king's euros and slick suited men, couldn't put pro cycling together again." - Father flahute nursery rhyme. Legend has it written on a cafe wall in Eeklo, but it might be Moorslede. Today should have been the kind of day cycling fans wait for all year. 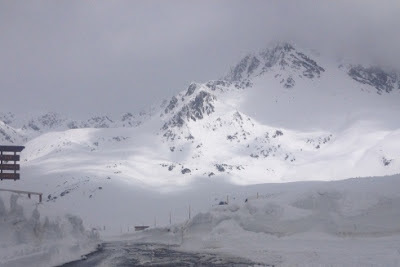 The battle over the Gavia and the Stelvio. Instead, it's a massive disappointment. Massive. Blame the weather? Climate change? Not me jongen. I'm blaming the collective caste of dopes that manage professional cycling. It's official. They're all completely full of shite. While UCI leadership this week applauds itself for doing a 'great job managing cycling', their management policies and decisions are precisely the reason why the world's wielerfans are sulking over their wheatabix this morning. Well, you can largely thank Verbruggen, McQuaid and a complicit RCS for this year's Giro-as-ice-station-zebra. Hunger, and the quote of the day. Saw yesterday that Sean's new autobiography is coming out later this month. Add it to your summer reading list jongens. 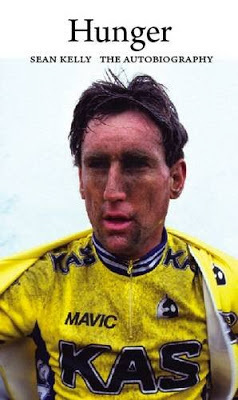 For those of you who like me are unabashed fans of the hardest man in cycling, there's some great Kelly stories and anecdotes here at Worldwide Cycles blog. Check it out. Two of my favorites. OK, all this work and no wielerplay makes Fast Eddy a fat boy. But ready or not, this past Sunday, it was time for something hard. Y'know, an event. I figured why not the Putnam Cycling Classic? 80 miles, 6,000 ft. climbing just north of NYC in Cold Spring Harbor, NY- on the Hudson River. It was a UCWT qualifier for the UCI Master's World Final in September in Trento. That's in bella Italia. Trento. Monte Bondone. Charly Gaul's climb. 'Il mio sogno': My recurring Walter Mitty fantasy dream. Of fanning a tiny gear up a mountain road, in the snow, dropping everyone, in a state of grace, on the way to winning the Giro, in a blizzard. An opportunity to race the legendary Monte Bondone. However, slim the odds, how could I not take a shot at that?